We received a copy of this title from the publisher, in return for an honest review. 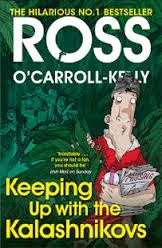 “Keeping up with the Kalashnikovs” is the latest novel in the highly popular Ross O’Carroll-Kelly series . Fans of his weekly column in “The Irish Times” might be surprised to know that this is actually the fourteenth novel in the series . This story revolves around the kidnapping in Uganda of Ross’ nerdish friend and former school team mate , Fionn , and the attempts of Ross to rescue him . Before that can be achieved Ross must deal with a number of more pressing issues closer to home . His long-suffering wife Sorcha is pregnant with triplets,his mother is dabbling in illicit substances and his eight year old daughter is up to no good . As Ross says “ Life in Killiney has become a nerve-shredding plate-spinning act” In addition to these , Ross manages to involve himself in the relationship woes of his great friends Oisin,JP and Christian ! The Ross O’Carroll-Kelly series has been a fantastic success over the years as people follow his story with regularity and dedication. I am a fan of this character, and the series, so looked forward to this latest book. It was a little darker then previous titles, with the pirate element, but had plenty of laugh out loud moments and was full of Ross' usual humour. Regular readers of the series are bound to enjoy the many moments of hilarity and cringe that ensue in this episode and I am sure there is more of Ross to come .